Today I do not want to concentrate on Austrian Cuisine itself, but on an Austrian wine. Grüner Veltliner is probably Austrias most important white wine grape variety. This wine grows mostly in Lower Austria, but is also grown in Styria and the Burgenland. You might get some of this wine in Slovenia and Czech Republic, too – but outside of this area there are no important wineries who produce Grüner Veltliner. 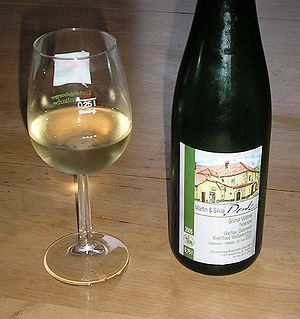 Grüner Veltliner developed into a huge success and was the first Austrian wine to receive good critics after the “Antifreeze Scandal” in the 1980s. In this scandal wine makers were accused of and convicted for using glycol to “improve” the wine (which is quite dangerous as overdosing of these wines could have killed you). After this scandal the Austrian winemakers turned their approach from cheap wines to high quality wines and Grüner Veltliner was the first wine to make this step. Grüner Veltliner is a rather dry white wine, which is very food friendly. There are different approaches to Grüner Veltliner – there is the wine created for the “Heurigen”, which will be drunk as a young wine wines (they are best in their first year). Others get drunk watered down with mineral water (Spritzer) – one of the Austrians favorite drinks at hot summer evenings. Some have an excellent taste which develops only after years – these come mainly from the region around the danube, where the wine gets a very pure minerally taste. In the plains it develops to a more fruity wine with a hint of pepper or even tobacco flavor and some stronger influence of peach or citron flavour. In recent blind wine tastings the best Grüner Veltliner wines beat famous french chardonnays like Mondavi or Maison Louis Latour. Grüner Veltliner developed into a huge success in the United States, where it is often called GrüVe (pronounced groovy) – this development lead into higher prices for the top wines, but you will still get great value for money at most of the wineries in Eastern Austria. If you visit Lower Austria or Vienna in Autumn you should make sure to visit one of the “Heurigen” – bars that serve young wine and offer typical snacks (which are run by the wine farmers). Grüner Veltliner is very food friendly and you can combine it to a lot of meals – in spring you can enjoy it with aspargus (a dish that does not fit to a lot of wines), it can be combined to veal, chicken or all kind of vegetables and it is obviously great to fish. I am a real fan of Grüner Veltliner and I hope you will enjoy it, too. I would be very happy to receive some feedback about your GrüVe experience.